25 Nov	This entry was written by dustbowl and published on November 25, 2008 at 7:59 pm. It’s filed under Design, Environment / Sustainability. Bookmark the permalink. Follow any comments here with the RSS feed for this post. If you don’t like the idea of having a sink above the toilet, you can also opt for a “regular” Caroma Dual Flush toilet. Caromas toilets look sleek, really work and are affordable. 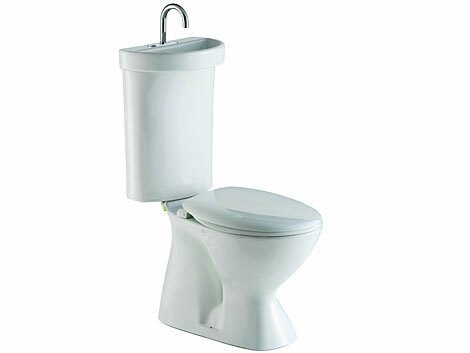 They offer a patented dual flush technology consisting of a 0.8 Gal flush for liquid waste and a 1.6 Gal flush for solids. Caroma, an Australian company set the standard by giving the world its first successful two button dual flush system in the nineteen eighties and has since perfected the technology. Also, with a full 3.5? trapway, these toilets virtually never clog. All of Caroma’s toilets are on the list of WaterSense labeled HET’s http://www.epa.gov/watersense/pp/find_het.htm and also qualify for LEED points. Please go to http://www.caromausa.com for more detailed information or visit http://www.ecotransitions.com/howto.asp to see why they actually work better than any other US toilet. Best regards, Andrea Paulinelli, owner ecoTransitions Inc.